This morning was rather profound. I set up a new altar to Kuan Yin in my space. It has the four cardinal directions made up of rose quartz stones, embodying the sacred feminine energies of compassion and kindness. And then a collection of stones from this area where I’m living, along with some stones from sister-friends and other sacred sources in concentric circles around Kuan Yin. The different colors in the altar are rather lovely. After setting it up and activating it with prayer and asking the stones to blend their energies, I was guided to do a spiritual journey with the whales. Seems that the humpbacks have taken me under their wing, though other whales may invite me in the future. The whales took me deep into the ocean–very, very deep. From there they ushered me to the spiritual council of grandmothers who sit in the heart of Earth Mother. There are thirteen of them there and they are so wise and compassionate and knowledgeable, it is truly such a powerful blessing to spend time with them. To even be invited to be in their presence feels so humbling and, well, incredible. The spiritual grandmothers had me join them in their circle. First I was sitting side-by-side with them as they spoke with me about this call for The Mother to be felt and experienced by all. They want all of us humans to come home to Mother. We used to know this experience of home viscerally and those were the days of balance and wholeness in our lives and communities. 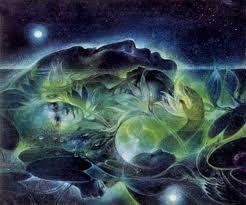 They were not just referring to coming home to Earth Mother but to the beautiful sacred Great Mother of Creation. The feminine aspect of the Great Mystery, in harmony with the masculine aspect of Creation. This permeates the whole universe and yet our two-legged societies here on Earth have forgotten this, for the most part. Then they invited me to lie in the middle of them for a healing. They ran their hands over my body, pulling the sorrow that overwhelms me at times out, from my wombspace down my legs and out my feet. My health is still not 100% from the lymphoma I was diagnosed with some years ago and they took their hands and pulled the toxic energies from me that have been causing my sickness. They worked on my heart also and lovingly pulled out some darkness there that has been blocking me from knowing and trusting what romantic soul twin love could be like. Once they were finished, I just lay there in their center feeling so light and full of goodness and wholeness. A quiet joy that permeated throughout me. Once I got up from the center they invited me to come back often and assured me they are always there for me. Always. They want me to share wisdom from them to the world. I bowed to each one of them and then hugged them, whereupon the whales escorted me out. Once I was with the whales, they invited me to spend some time swimming with them, and then to sing with them. I actually felt my throat chakra opening up as I joined in song with them to send this beautiful spiritual energy the grandmothers had blessed me with out into the ocean also. 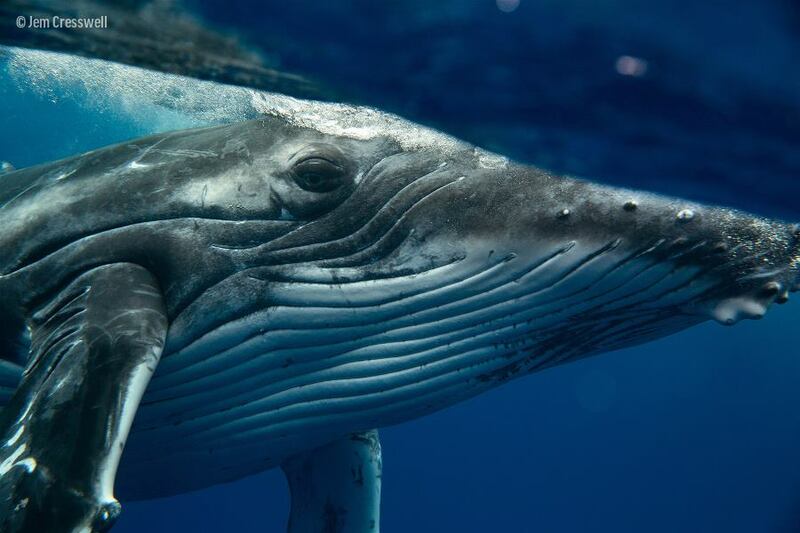 A song that traveled through the waters of the world in partnership with the whales songs of strong healing energies. Then the whales brought me back to my room with Kuan Yin’s energy basking through the space. What a gift… a deeply humbling gift to be able to experience this. Thank you, Mother — Great Mother. Thank you, beautiful whales. 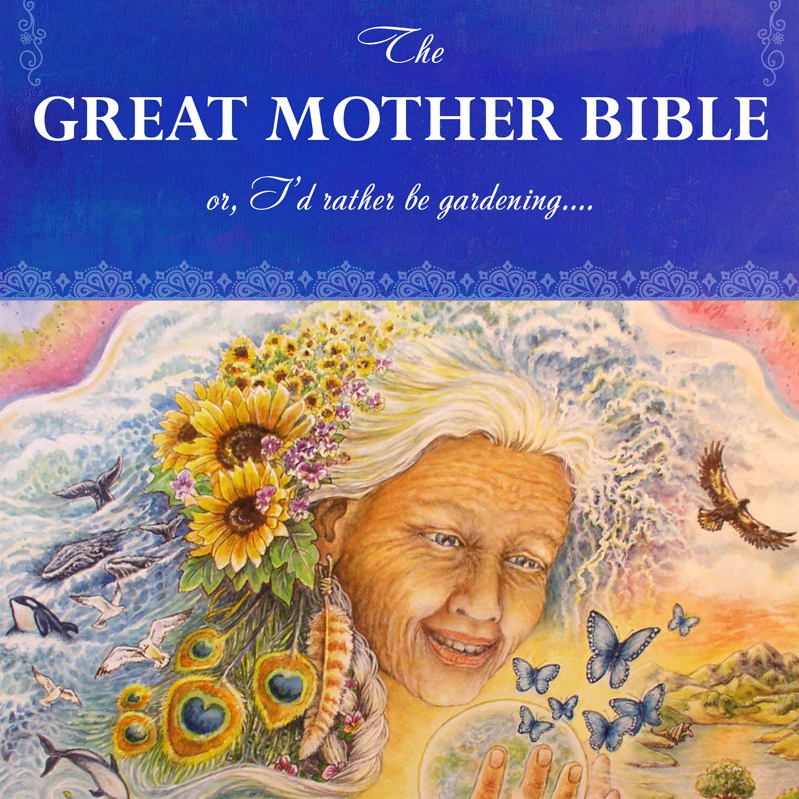 Thank you, Spiritual Grandmothers. Thank you. Mother: Sarah, it’s so great to see you back here again. I see Mr. Tufts brought you in off the trail all safe and sound. You have some branches in your hair. But no worries. They look good on you. Sarah: Thanks, Mother. Yeah, Mr. Tufts can really fly through all that underbrush, considering how tiny his legs are. I was so excited to see him there on the trail waiting for me just now. Plus, the stone turned the most stunning shade of blue-green earlier, back at my apartment. Almost an ocean teal shade with dark blue around the edges. I was watching it all morning to see if or when it would turn and it did! I’m so excited to be here! Mother: Yes, yes, I promised you that it would. Good, good. Well, I brought us some tea and some ugli fruit cookies. Mother: Yes, they are kind of like an orange, but uglier. And don’t ask me if I made the cookies. I have my ways, you know! The next thing you’ll be asking me is whether I have a kitchen I cook in. I can’t give away all of my secrets. Can’t do that. As they were talking, Mother pulled out a basket at the base of her bench and proceeded to unpack a beautiful English tea set of bone china along with a matching plate of cookies with a dusted maple sugar coating. She poured each of them a cup of tea and served the cookies. Then she passed out beautifully embroidered pressed napkins. Sarah watched in amazement. Please, learn to love your Mother. Me, your Earth Mother. I give you all a planet full of love. That’s what all this evolution is, love in action. All these trees and the food you eat and the air you breathe, it’s earthy-love in action. I give all of this to you and love you all so much. But it is not until you give your love back to me that our relationship can grow. I don’t just mean putting a bumper sticker about loving me on your boxes on wheels. I like those and all that. But I mean really love me. Really feel your love for me. I would like a relationship with each and every one of you. I would. How do you give your love back to me? One of the best ways is to offer blessings to me. You can offer tobacco at the base of a tree that calls to you. Anywhere. Tobacco has such magical properties. I love tobacco. The good tobacco, hopefully grown organically—you know, without all that toxic stuff that I did not create. Or pour some honey on the ground. Or milk. Any kind of offering. You can do this while saying prayers to me. Thanking me. Or the trees. Even the mosquitoes out there biting you. You can thank them too. Just kidding. I know you two-leggeds don’t like the mosquitoes so much. Oh, well. So it goes. Native peoples put out ‘spirit plates’ full of food when they have big feasts. This shows their love for me, their giving back. Just an example. Another way is to burn a little smudge in the morning. Oh, you probably don’t know what smudge is. Well, there are certain herbs that my beautiful two-leggeds who remember the old ways burn. You can just burn ceremonial white sage, or add cedar to it and other herbs too. This is a wonderful way to send prayers and bless your home or apartment. Burning smudge brings in such lovely peaceful energy into your space. 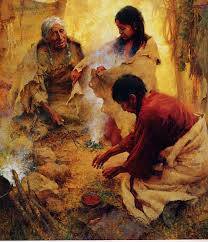 As you’re burning the smudge, it is even more powerful to call out to me and the Great Mystery and tell us that you love us. If you don’t know what smudging is, ask a friend and they’ll tell you. Burning some ceremonial sage is a good place to start. I know some two-leggeds use what are called smudge sticks too. You can even set up an altar to me. Nothing fancy is needed. Maybe some stones and some animal figurines. That’s all you need. You can light the smudge over the altar and pray to me and the Great Mystery/Creator there. If you want to get fancy, you can put some type of image of the Sacred Feminine or something like that on your altar. I like that. If you really want to express your love to me and be serious about it, well then it gets more complicated since your culture insists on being so disconnected from me while still living right here on me. A very big step is to wean yourself from those things that you’ve broken my soil or skin and dug into my rock layers or bones to get. Those things you call fossil fuels, uranium, and heavy metals. Many of you know about this weaning need. But gosh darn it, not all of you have discovered this wisdom. Some of you, mostly two-legged males who wear those funny suits with the tight things around the neck, just have not gotten it yet. But you will—in time, you will. Hmmm … I know many of you who are clear about this weaning need have been marching and trying to get through to those two-leggeds with the tight things around their necks. I want you to forgive yourselves for the fact that you are still using these fossil fuels, etc. The sound of all of your guilt for driving a car, or eating food that was not grown in your backyard, or whatever, is not a pleasant song to me. The last thing I want is for you to be walking around beating yourself up with a bunch of guilt in your bellies for something you were born into. It was not your decision to start drilling just a wink of time ago. That was someone else who has already died, and he had a good talking to after he passed over. Oh, yeah. His soul knows better now. So, please forgive yourselves, okay? Now, back to the ways that you can love me. Yes, there are all of those things that you’ve created. What do you call them? Oh, right, chemical compounds. Some of you with very creative minds have concocted these compounds and they keep on hanging around in my soil and floating all over the world in my air and the water. I’m not sure what you were thinking. It’s a violation of one of my laws for something a two-legged concocts to stick around and around and around. A little aside. One of the things I absolutely love about the Great Mystery’s universe is this thing called entropy. The Creator is so brilliant. This entropy, it’s about how everything is always breaking down and scattering out. It’s the reason that you need to keep on dusting. Entropy has scattered that dust all over, just as it makes bubbles of soap go all over the place into the air. Entropy has helped me so much with evolution. But your chemical compounds are going all over the place too thanks to entropy. I don’t like this. Some of these chemicals of yours are extremely tiny and they’ve been traveling through the air and in the waters, and darn it, they’re making my frogs sick! I did not create frogs to be born with extra legs. And my poor fish! Some of them are being born both male and female, and this was not my design plan. Many of you two-leggeds are having a hard time making babies too. Or getting disastrously sick. You wonder why? Others of these bunches of chemical compounds are bigger. The stuff you call plastic? They are messing up my beaches, my swamps, everywhere. My turtles are getting sick eating the plastic waste, and on and on. So ugly. And they’re killing some of my babies. Nets floating around in the ocean are trapping my whales and dolphins. You’re messing things up, and I really wish you would get some common sense and stop making those things. There are wiser ways, you know. Don’t you know one of my laws is nothing lasts forever except elements and atoms? Everything goes back to my skin or bones and is used again and again. Almost every single thing is food for something else at some point in time. But somehow most of you did not learn this. I know some of your chemicals do eventually fall apart and break down, but that is only after they’ve messed a lot of things up. I think I need to set up my own school to teach you how to take care of this world of mine. It will be called Mother’s School. But, no, I suppose I’ve already created that, and it is called Earth. You are all living and breathing it, and supposed to be getting the lessons right now. Unfortunately, your grades are not very good. At least, for most of you. And some of you are getting very bad grades. Especially those male two-leggeds who sit at those desks inside so far away from my beautiful soil and make decisions about digging into my skin and bones for your so-called fossil fuels. I have some words for those two-leggeds, but I’m going to not say them here. Nope. But again, please don’t go to that guilt place. That’s really not helpful for you or me. Your culture just started out with some bad ideas not too long ago and then something called greed came in and you all are living with the … well, the ripple effect from those bad ideas. I hope that’s a good way to put it. Okay. Another way to love me is to go plant trees. Plant more trees. I love my trees! Talk to them as you plant them. Baby them. They are baby trees. Make sure that they are well watered and the soil is good. Check on them. These are young living beings who need TLC. They need to be loved over time just as you do. You know I really like this sustainability thing some of you are talking about. That is a wonderful way to love me! But you know, it was going on long before you all ever existed and was far beyond your two-leggeds’ ideas of sustainability. It was and still is a planetary dance of life, and energy, and celebration. It’s been a wondrous web for a long, long time. Oh, a delicious, magical, amazing web of my insects, and flowers and trees, and four-leggeds. All my beautiful four-leggeds … and six-leggeds, and finned ones and winged ones. The list is so, so long. Oh, there are so many ways to love me. It is hard for me to list all the ways in one message. The key is you can just start doing something today. I guess the most important thing is to realize I am Sacred. I am part of the Great Mystery, just as you are too. But I am your Mother here and my whole planet is about as Sacred as you can get. You can pray to me as well as offering prayers to the Great Mystery/Creator. I especially love it when you talk with me. All of you. I hear your prayers too. Really I do. And many of you are learning to do this. This makes my heart sing. Okay, gotta run. Sarah, you’re the best. I love you so much. Maybe next time I’ll bring a joke. That would be fun! Oh, and why don’t you think of a question to ask me for our next meeting too, okay?